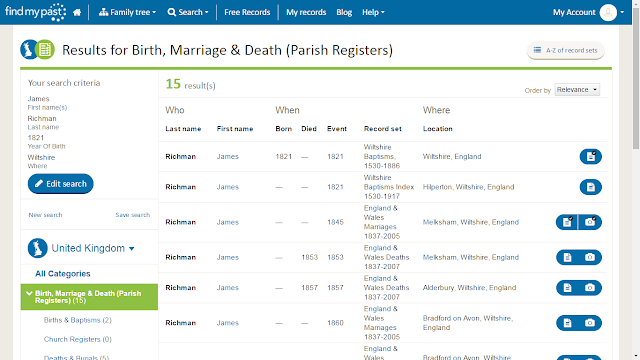 Findmypast announced today that they have added parish register records for Wiltshire in England - see Findmypast Launches Six Counties In Six Months - Wiltshire This Month! 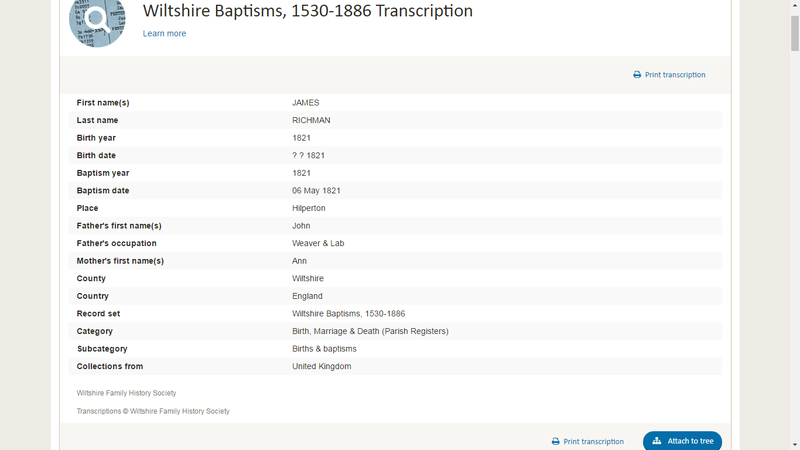 I have exactly 12.5% of my ancestry in Wiltshire before 1855 or so, and this addition to the collection makes me happy. I entered my 2nd-great-grandfather's name ("james" and "richman") in the search fields, checked the "Name variants" boxes, and selected "United Kingdom" from the "WHERE" field dropdown menu, and added "Wiltshire" to the field to the right of the "WHERE" field. I added a birth date of 1821 and kept the range "+/- 2 yrs." The first item on the Results list was for an 1821 entry for James Richman in the "Wiltshire Baptisms, 1530-1886" database on Findmypast. That's probably my guy! This information was transcribed by the Wiltshire Family History Society. Thank you, Moonrakers! I see that the baptism date was 6 May 1821 in Hilperton, with parents John (a Weaver and Lab[ourer]) and Ann. Unfortunately, this database does not provide a source citation for the specific record. The search results do not specify the parish name which would be useful, especially for common names. 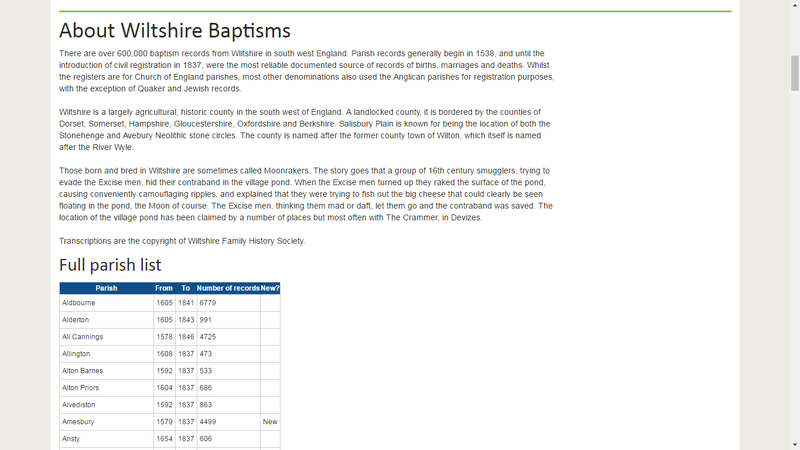 A little further down the page is an explanation of Wiltshire Baptisms, and also a list of all of the parishes included in this database. The list indicates that there are records for Hilperton between 1622 and 1837, and that there are 3,075 baptism entries. 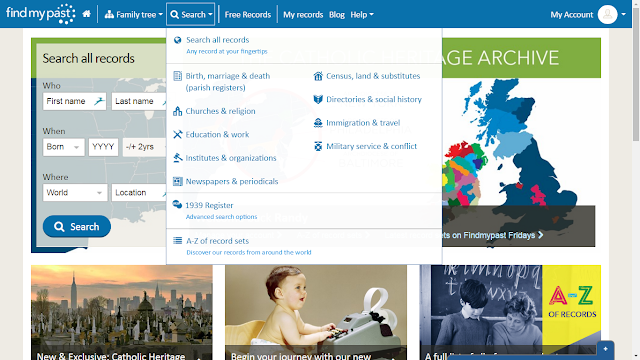 Most of the records end in 1837, when Civil Registration started. However, some of the Pariah Register records continue on. Unfortunately, Hilperton stopped at 1837 in this database, even though I've seen parish records on microfilm up into the 1880s and perhaps later. Note that the list above is for all "Births and Baptisms" entries, not just the "Wiltshire Baptisms, 1530-1886" database, in alphabetically order (by first name and last name). At this time, I only see Baptisms from Parish Records, and not Marriages or Burials from the Wiltshire Parish Registers. Maybe I'm wrong? This still works for me. I wish there were record images available, but they aren't yet. I have accessed the images on Family History Library microfilm, and have collected records for my Richman, Marshman, Warren, Rich, Hill and other surnames in Hilperton and surrounding parishes. Now I need to compare what I have with this database on Findmypast. Disclosure: I have a complimentary Findmypast subscription, which does not affect my objectivity in reporting on family history issues. 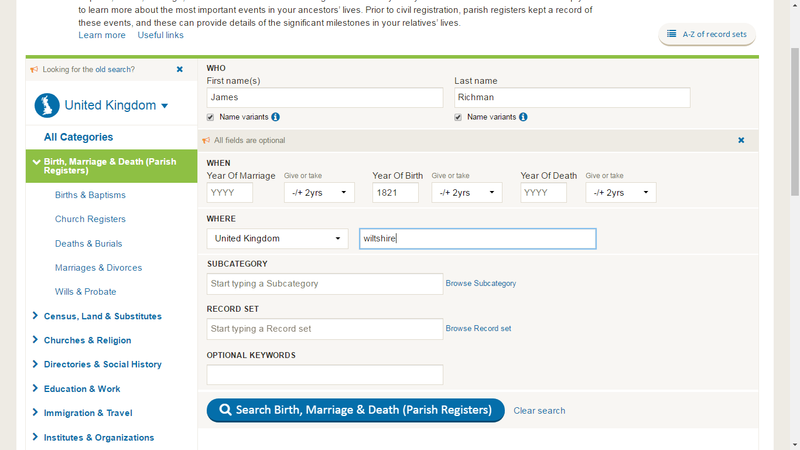 It looks to me that you only selected births and baptisms (green rectangle) but there are marriages and deaths to be found if you select those items. I clicked on the Marriages and divorces" record set and on the "Deaths and burials" record set and there were no entries for records from parish records. 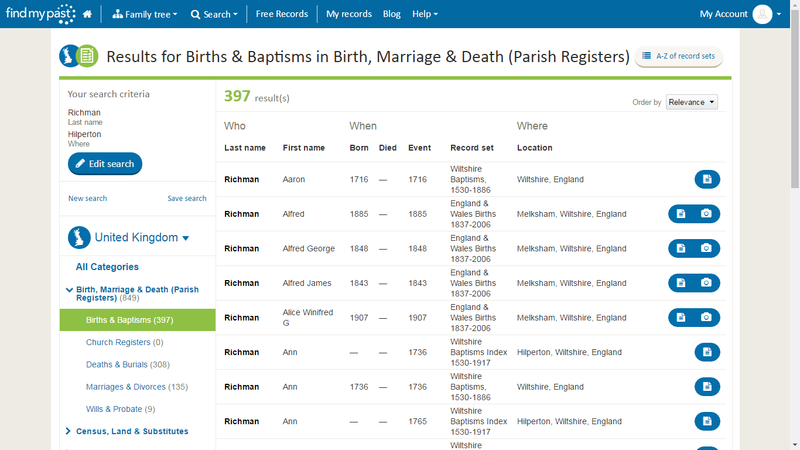 There was an "England Marriages, 1538-1974" database and a "Wiltshire Burial Records Index" database, but they were there before, and nothing identified as parish records.